-True Death Industrial madness, not for weak hearts. -Pure underground Black Metal that shows total dedication to the dark side of life. -Epic Pagan Black Metal from Argentina, recommended! -A tiny piece of Finnish underground Death Metal history... Highly recommended! -Cascadian Black Metal, eco-spiritual sound with nature ritual atmosphere. -Soaring, glacial Black Metal unveiling northern purity throughout four hymns of iron and ice. -Two dreaded entities from the Finnish Satanic Black Metal underground are now united on this split, a must! -Back in stock! Raw Black/Death Metal abomination released under the wings of Morbid Moon Records. -Fourth full-length album of True Teutonic Black Metal, mandatory! -This disc features one song, clocking nearly 40 minutes of disgust, sorrow and hatred towards the modern world. -Raw Black Metal from Australia. -Raw Black Metal from Argentina in the vein of Finnish hordes. -Mysterious Black metal split from the bottomless pit of the underground. -A beast that shoegazes, pops, and drones, sidestepping conventions of many genres to create something raw and confounding. -Remastered version of the demo 1998 and 2000 of this cult Polish Black Metal project. -Blackened Noise Industrial released by Dodsapparaten. -Devil worshipping Black Metal that should need no introduction. -Skillfully honor the ancient masters with a blackened Thrash Metal attack. -Prepare to be assaulted by an unrelenting blitzkrieg of raw and evil Speed Metal. -Lusitanian Black Metal since 1990, a must to all True Black Metal Cult worshippers. -Bizarre down tempo Black Metal only for those with strong minds. -Back in stock! Bestial War Black Metal released by Morbid Moon Records. -Lo-fi Black Metal from the crypts, deranged rituals glorifying Death. -Majestic Pagan Black Metal by Italian and Bulgarian members. -Floridian Winter are a Jacksonville Blackened Punk band and Night Falls Haunting is a Black Metal band out of Australia featuring members of Carved Cross. -Raw and cold Iberian Black Metal Art with proud battle atmosphere. -Featuring interviews with Rotting Christ, Christicide, Eternity, Svartidaudi, Lux Divina and more. -Heathen Black Metal including Pantheon and Dark Fury members. -Raw occult Black Metal from Japan. -Atmospheric Black Metal with misty archaic heathenism. -Cult Polish Black Metal act, highly recommended! -Seven tracks of violent Pagan raw Black Metal, reminiscent of eastern woods. -True Finnish Black Metal in the perfect Nordic style. -Back in stock! New Goatmoon recording with alternative line-up. -Depressive and experimental Black Metal from Japan. -Cult and melancholic Black Metal from Japan. -A heavy dose of traditionally inspired Black Metal that crushes the bones of the weak. -A collection of older and previously unreleased recordings exhumed and abused for the first and last time. -Seven tracks are featured on this pitch black monument of sincere Satanic devotion, recommended! -Drone and ultimately slow meditative Black Metal with hypnotic medieval folk melodies. -Extreme Dark Industrial recalling the early days of Cold Meat Industry. -Cosmic Noise Industrial from France. -Ancient Greek Black Metal, the grand successors of the parth marked by Thou Art Lord, Necromantia and rotting Christ. -Raw and uncompromising Finish Black Metal. -Third album of this raw, devastating, hellish and old school satanic Black Metal in the early veins and with a huge impact of Darkthrone. -Something like Ildjarn trying to record a homage to classic Heavy Metal, balls out and and straight to the point! -Dark and grim Japanese Black Metal mixing aggression and melancholy, this album contains demos, rehearsal tracks they have unleashed between 1997-2000. -Japanese Black Metal, this CD is including rare rehearsal tracks and promo materials they made between 2001-2002. -Japanese Black Metal, this CD contains demo split, live tracks from 2002-2006. -This album follows the enigmatic S. Holliman further down the proverbial rabbit's hole of nothingness. -Featuring interviews with Monarque, Totale Vernichtung, Cemetery and more. -Traditional Black Metal from Finland. -Cult Finnish Black Metal, enough said. 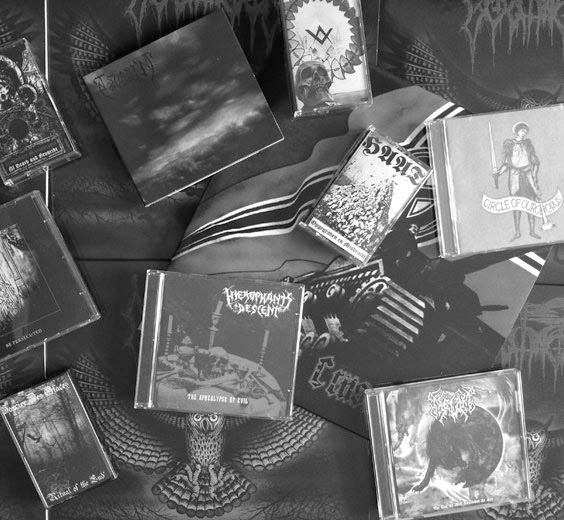 -Black Metal from Finland, compilation of 3 demos. -Cold, harsh, monumental and eerie Black Metal with inhuman vocals. -Depressive Black Metal project from Australia inspired by the likes of Burzum, Striborg and Xasthur. -Aggressive yet atmospheric Black Metal, expressing misanthropic views and darker expression of a spiritual path. -Return of this French cult, ultra extreme and raw Black Metal. -Contains 3 tracks of the band, as well as a cover of Mortifera's Le Revenant, recorded professionally live, as well as a new track called Vermines. -A truly evil and all consuming split from two of the greatest hordes of Iberia that should need no introductions. -Underground Polish Black Metal veterans. -Hypnotic funeral Black Metal hailing the glorification of Death. -Mortifera presents the last two recorded tracks featuring Neige in the line up and a third song from the Meledictiih session, while Be Persecuted presents a long track featuring their typical slow paced sorrowful style. -Acoustic Ambient Neofolk, Vinterriket side-project. -The debut full-length album of this cult Polish horde, Night Sabbath Metal! -Luciferian Death Metal emerging from the womb of Helvetron and Nyogthaeblisz. -French Night blasting black punk extravaganza. -Primitive and minimal German Punk-influenced Black Metal meets raw melodic Black Metal from the Basque Mountains, highly recommended! -Crazed Black Metal spawned by the Pleskau Brethren Circle from Russia. -The embodiment of the dark, obscure and blasphemous aspect of Death Metal. -German Black Metal in the Norse tradition, highly recommended! -Raw and grim Black Metal necromancers from Germany. -Raw and primitive mid tempo Black Metal with punk-styled drums and vocals of utter madness. -This cassette documents three necromantic hermits on a spiritual journey to find nothingness. -Official rerelease of the first Primigenium demo from 1994, highly recommended! -This work of evil art drives deep into the mysteries of death, dragging the helpless listen along as their sepulchral Black/Death conjures its spell. -Raw and harsh Black Metal from Australia, total Black Legions worship poison for rats. -Recorded during introspective mental exercises, in preparation for the final subscendence. Unorthodox and experimental. -Amazing Polish black metal and a definite must-have for fans raw, atmospheric Black Metal. -Beautiful, desolate and mysterious Galician Folk music. -Australian Black Metal madness featuring members of Mors Vincit Omnia. -Worshipping at the altar of classic Impaled Nazarene, this Bolivian horde create a ritualistic whirlwind as hellish and humid as their South American stomping ground. -2013 repress on No Colours Records. -Epic and powerful German Black Metal in the tradional vein. -Fast and agressive Black Metal, nothing more to say. -An alliance executed in three pestilential movements by the Pleskau Brethren Circle. -Compiles all demos prior to their cult debut album from 1991 as well the proceeding Maculated Life demo from 1992 and rare rehearsal and compilation tracks. -A strong piece of cold and haunting Black Metal under the wings of Les Productions Heretiques. -A monument of pure Black Metal, mandatory. Black Sun Society edition. -Blackened Doom that is not only dark and heavy but also catchy sets this band apart from the others. -Suicidal depressive Black Metal split. -Deep, dark atmosphere, great sound and original arrangements. Dark and unique Black Metal. -Unholy Chilean Black Metal with members of Animus Mortis. -Black Metal with technical and atmospheric touches. -Underground Black Metal from Argentina produced by Voices Defying Death Records. -Majestic and intense Black Metal with depressive touches. -Very limited stock and highly recommended. -Cult Demo from 1995 reissued on vinyl, Godkiller side-project. -An hommage featuring Helgrindr, Ornaments of Sin, Elitism, Esphares, Draugen and more. -Back in stock! Putrid Black Metal assault produced by the mighty Autistiartili Records. -Raw rotten Black Metal, needs no further descriptions. -Over 20 minutes of exclusive new material plus a video clip, comes in nice digipack with 16 page booklet. -First full length album release by Yorkshire Heathen Black Metal lone wolf, raw and oppressive Black Metal art. -Majestic Black Metal Terror from Germany. -Raw Black Metal distilled to the essence of unforgiving dark nature, highly recommended! -A journey like no other, wild and winding to the very end and warmly draped in authentically analog production.